Is It Really O.K. For Pets To Drink The Pool Water? There are alot of pet owner who also own swimming pools, and there always arises the question of… Is it safe to allow your pet to drink the pool water? It is recommended that you pet owners limit the amount of pool water intake of your family pet. The chemicals used to maintain proper pool balance is not good for regular drinking for not only pets, but humans as well. Keep as much fresh water outside as possible to limit the pool water drinking. If you pet is free to travel in and out of the house, then keep just as much fresh water inside as outside of the home for your pet to drink. Vets have said that too much intake of chlorinated water will destroy the good bacteria in pets that helps with digestion, which will cause them to get sick. Watch your pets closely if in fact he/she is drinking out of the pool regularly, as it could cause consistent diarrhea, constipation, and even vomiting. 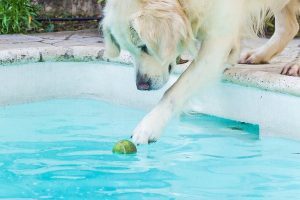 If at all possible, try to prevent your pets from drinking your pool water, so the possibility of future health problems can not occur. Good to know…Does anyone have any ideas on how to keep ducks out of the pool. You would think a large dog in the back yard would help, NOPE! Any thoughts at all? Thanks for your suggestion, and I completely agree with you, that swimming pool water is not fit for humans as well as for pets to drink, now i will also take this matter seriously..